The latest beer from Wild Heaven Craft Beers launched this month. 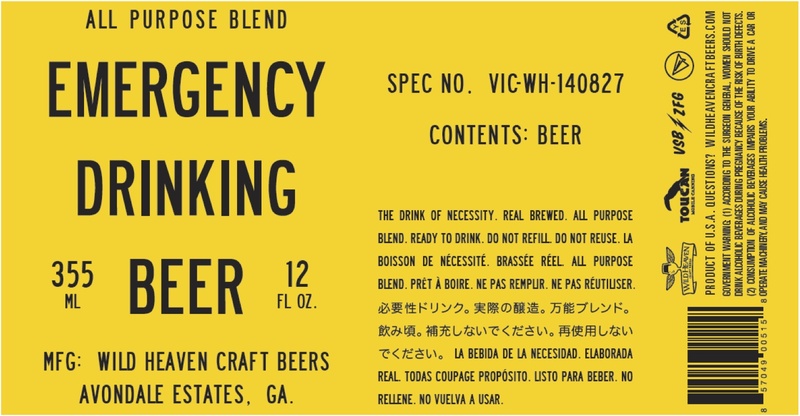 In collaboration with beverage maestro Paul Calvert, brew master Eric Johnson developed Emergency Drinking Beer. 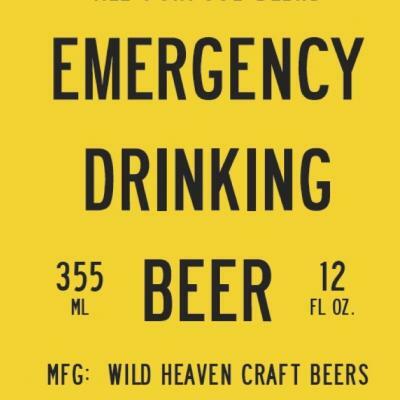 Because sometimes, getting your hands on a beer is an emergency-level situation. “Really, the style is ‘beer,’” president Nick Purdy wrote in an email to Atlanta beer lovers. Coming in at an easy-going 4% ABV, the style is perfect for Pilsner fans. Look out for pops of citrus and lemongrass, with hints of Portuguese sea salt. Widely available on tap. The weekend of rain couldn’t stop the biggest 420 Fest in its history last weekend, and SweetWater couldn’t let the moment pass without a commemorative beer. The Dank Tank series launched its 420 Fest Double IPA, brewed with experimental hops Lemondrop (big citrus) and Eureka (herbaceous with black currants). Nearly two pounds of hops were used per barrel, yielding an 8% ABV. Definitely fit for the season (and in limited release). Widely available on tap and in 22-oz bottles. Brewers are always tinkering, and the latest Three Taverns experiment has brought a new IPA to the fold. The Belgian-style brewery just introduced A Night On Ponce IPA, an American-style brew modeled after A Night in Brussels, just with American yeast. This beer joins A Prince of Pilsen in the outlier series, which houses the brewery’s non-Belgian beers. Speaking of American things, Three Taverns is switching their year-round beers from the Euro 4-pack to the 6-pack more familiar to stateside consumers. This transition is taking place throughout the month, so we’ll soon see Single Intent, A Night In Brussels IPA, and White Hops in this format. Also, the quadrupel Quasimodo is back for the spring and summer seasons. Find the dark, fruity beer on tap and pouring at the brewery. Not even a year old, Second Self is now distributing two of their core beers in cans. The delightfully spicy Thai Wheat and malty Red Hop Rye are available in 12-ounce sizes, ready to accompany you wherever cans can go. Check out this map for availability. Now that spring is officially in effect, the kind folks at Orpheus saw it fit to open their doors on Sundays. Venture off of the Atlanta BeltLine’s Eastside Trail, cut through Piedmont Park, and end your trek on the brewery’s patio. Your reward: the seasonal saison Serpent Bite is back in rotation, this time even more sour than last year’s version, and with increased Mandarina Bavarian dry hops. Open 2-4:30 p.m. on Sundays. For more tour information, visit orpheusbrewing.com/tours. Holding down the fort in Athens, Creature Comforts also launched beers in cans this month. The Berliner Weisse, Athena, and the all-star IPA Tropicália, hit stores and then quickly sold out in multiple places. A fitting debut for the beer company that celebrates their first anniversary this weekend. Naturally, the brewery is throwing a party. Attendees will find close to 20 brews on tap (subject to change) and special stemware at $25 each. Anniversary tour is Saturday, April 25, 11 a.m. to 2 p.m. at the brewery. For more information, visit creaturecomfortsbeer.com. The Kennesaw brewery-that-could turns three this month. Last year’s anniversary bash saw 800 revelers. This year the brewery says to expect even more. In addition to a live band, the brewery has confirmed that 20 beers will be available (subject to change) this Saturday, April 25. Expect fan favorites pale ale Ezekiel’s Wheel and the Cannon Dragger IPA, and be on the lookout for potential specials, such as Cobra Verde (Mexican cornbread rye), and Killboy Powerhead, a creamsicle ale. Admission is $10 or $15 with specialty glassware. For more information, see brewery updates at burnthickorybrewery.com.